The dust has settled on the floor of the Legislative Council, more succinctly known as LegCo. Following a six-week campaign period, a record high turnout at polling stations voted in Hong Kong’s youngest legislature since the handover in 1997. Now, 17 of the Legislators will be under 40, compared with seven last term. Young new joiners have brought down the average age of the chamber to 49 from 54. The outcome of the election has not only affirmed the power of Millennials in social mobilisation, but also their influence at home. The entry of Millennial Legislators reflects a growing desire amongst Hong Kong people to seek change. How companies adapt to Millennial values and expectations will become a key factor in determining corporate and brand reputation in the local market. 2.2 million people voted in the election with a record turnout rate of 58%. 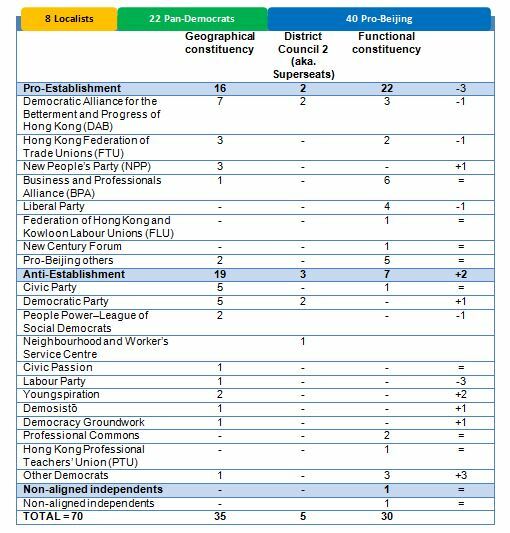 Of the 70 LegCo seats, 40 have gone to those from the Pro-Establishment camp (down 3 seats overall), and 29 have gone to the opposition (up from 27), including 8 Localists. On the whole, the Pro-Establishment has retained their control of the legislature, while the anti-establishment camp has retained their one third blocking minority. The opposition that was once known as the Pan-Democrats have reduced in number, and they are now sharing power with Localists who call for Hong Kong’s ‘self-determination’ and a more combative approach in dealing with the Government. Gains for the Localist movement were largely fuelled by the rise in the number of first time voters, but that is not to say they are the only ones who supported Localism. Altogether, Localist candidates earned over 400,000 votes, which well exceeded the number first time voters.While full voter data is not yet available, it is clear that a significant proportion of the other supporters are older than Millennials. A common interpretation is that these older supporters come from relatively low-income districts. Living in the margins of prosperity, they are disgruntled by the establishment and are inclined to support the protectionist, welfare-oriented agenda of the localists. While this is indeed the case, Localists have also secured a fair share of middle-class votes. On Hong Kong Island, for example, 23-year-old Nathan Law, one of the student leaders of the Occupy Movement, consistently won 13%-19% of votes in populous middle-class neighbourhoods, higher even than in the largest public housing estates. What happened was that many young voters have engaged in debates with their parents on the candidates and have successfully persuaded parents make the same choice as them. Their persuasion was aided by the Localists’ creative marketing that spoke not only to young people, but also appealed to the wider Hong Kong public. Millennial Legislators will have a strong influence over Hong Kong’s political agenda in the next four years. When Millennials will gain comparable influence over domestic purchasing decisions is yet to be seen, but it is clear that they now have a much greater say at home. Their sensitivity to social justice will most certainly raise the standards of corporate citizenship in Hong Kong. With slowing growth in mainland China, the Government and the establishment will put greater pressure on the new legislature to support key industries that drive growth, including financial services, trading and logistics, and other professional services.Meanwhile, the opposition will advocate for policies that foster community-based economy, support innovation and the creative industries, and tighten control over the property market. Companies whose business can create shared value with the local community will have an upper hand in earning public trust. The bar for good employers will rise. A number of labour or employee-related issues will likely dominate headlines for prolonged periods, including an overhaul of MPF, standard working hour legislation and LGBT rights. Young Legislators, who are by far the most effective (though not always accurate) communicators we have seen in Hong Kong’s political arena since the handover, will raise awareness of related bills and proposals amongst young employees, reinforcing their sense of entitlements to benefits or treatment that are not currently part of the norm. The large number of young Legislators also means that policy education will become a critical part of lobbying efforts moving forward, which may require lobbyists to go “back to basics” when explaining their policy positions. In the immediate term, businesses will need to carefully monitor the evolving legislative agenda and opportunities to influence the debate, as well as build relationships with the newly elected members of the legislature. The new Legislative Council takes office on 1 October 2016, and will serve a four-year term until the next election in 2020. These appointments aim to strengthen EY's digital and creative capabilities and offer solutions and insights to clients.. The Directory Big Won results are in, and Ace Saatchi & Saatchi finds itself at the top of the Philippines’ best agencies. ..